Professor and Author Jim Collins took the stage at a Direct Selling Association conference. The room, a mix of entrepreneurs and corporate executives, populated the large ballroom. Major leaders such as Pampered Chef, Avon, and Amway peppered the crowd. The industry also welcomed newer, trend-setting companies including Stella & Dot and Origami Owl. The words Collins shared united the audience, because it had to do with potential. Could we all rise from “Good…to Great?” Our companies…and ourselves? It’s the age-old question: Are we reaching our potential? Can we dream the big dream, and reach it? In this post, I feature a summary of the three major steps which theorists and articles touch upon time after time. Tools – tools such as Mind Mapping help put entrepreneurs, and others, through an exercise of unlimited brainstorming based on a central core concept (e.g., “Music / Entertainment”, or “Fitness”). Any word that comes into your mind goes down on the page and is organized later for idea capture. Read this article for more tools and techniques. Educators, see the EITC curriculum for a Mind Mapping exercise. 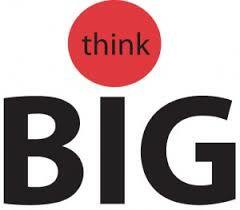 Mindset – Getting in the right mindset to “think big” can also be a challenge. In this article, Deepak Chopra cautions us against what can be a natural resistance to new ideas. Looking to the examples of others and thinking on a daily basis about what you want to accomplish can be helpful ways to break through this barrier. Set a goal – Setting a goal, ideally with actual numbers / measurements, is key to reaching a goal. More from Melissa Joy Kong on her goal setting process. Overcome challenge – Inevitably, there will be challenge. A Japanese proverb states: “Fall down 7 times, get up 8.” Decide how you will respond to and overcome challenge. Taking Chopra’s advice from Step 1 to expand our minds on this topic, consider reading this article on “Famous People Who Found Success Despite Failures” by Benny Hsu. Multiple levels of mastery – Harvard Business Publishing shares an article, “Nine Things Successful People Do Differently” detailing overall executive mastery skills from being specific and focused, to determined and gritty, to better vs. perfect, to driving what needs to get done. Engage in the 12 questions. Have no more than three major priorities at any one time. Make a “stop doing” list. Evaluation (with peers and mentors) – Finally, many entrepreneurs cycle through a mental or actual list of areas targeted for refinement, often with the help of others (e.g., entrepreneur groups, mentors, etc). Educators, see the EITC curriculum , Module 3, for a list of established and start up entrepreneur resources. More Information The NFIB Young Entrepreneur Foundation is a 501(c)(3) organization promoting the importance of small business and free enterprise to the nation’s youth. More information is available at http://www.NFIB.com/YEF. The Foundation is associated with the National Federation of Independent Business; NFIB is the nation’s leading small business association, with offices in Washington, D.C. and all 50 state capitals. Entrepreneur In The Classroom. The NFIB Young Entrepreneur Foundation Entrepreneur-in-the-Classroom (EITC) supplemental curriculum exposes students to entrepreneurship and the necessary steps to take an idea and turn it into a business. The free curriculum can be integrated into classes teaching a variety of subjects including music, art, fashion, business and many more. Just register for full access to the Entrepreneur-in-the-Classroom curriculum. Click here for more. Entry filed under: Business exercises, Curriculum, Educators, Entrepreneur, Free, Helpful tips, Resources, Teachers, Teaching tools, Young Entrepreneur. Tags: Amway, Avon, DSA, goal-setting, goals, Good to Great, How to Think Big, Jim Collins, Origami Owl, Pampered Chef, planning, thinking big. 2015 NFIB Young Entrepreneur Award Applications Open! Who are You and How does this Influence your Entrepreneurial Journey? Entrepreneurial Field Trip--Teaching Entrepreneurship both In and Outside the Classroom! Opportuntities | Just doing my part on 2015 NFIB Young Entrepreneur Award Applications Open!